Every year wildfires destroy millions of dollars worth of property, threaten and displace thousand of lives all around the world. Even as I write this, California, my home state, is suffering from over 2 dozen wildfires, with one massive blaze far from being contained. Unbelievably, wildfires are not rare, with the majority of them caused by people tossing cigarettes or failing to practice good fire safety. Wildfires are destructive entities that are amplified by wind, limitless fuel sources and arid environments. With a rapid FROS (forward rate of speed) of 6.7mph, depending on wind conditions, wildfires can cleave a path of destruction eating everything in its wake. And if that wasn’t bad enough, natural barriers can’t even stop a wildfire, as they are known to “jump gaps” like highways and rivers. Wildfires can occur anywhere with dry hot climates. They spread fast, change directions, and you’ll probably die from the smoke and heat before ever being touched by the flames. Battling and containing wildfires is also an incredibly challenging task. As firefighters risk their lives to control the blaze, it is our responsibility to help by also being self-reliant and practice self-rescue whenever possible. Have a bug out bag and emergency kit prepared so evacuation can be quick and decisive. Include items such as: multi tools, axe, friction saw, knife, shovel, radio, non-perishable foods, emergency numbers and maps. Use materials in home construction and landscape that are fire retardant, and can potentially slow the burn rather than accelerate it (e.g. Hardwood trees instead of Fir Trees). If outdoors, and on foot, stay away from areas with plentiful fuel sources, canyons, valleys, and areas formed like a “saddle.” Stay low, and keep yourself covered with a flame retardant blanket to protect you from the heat and smoke. If being overrun by the wildfire, look for a hole or any cavity that’s far from any fuel source, lie face down in it and cover yourself up until the fire passes. Find the nearest designated public shelter. In the U.S, text SHELTER + your zip code to 43362 (4FEMA). Be cautious of the environment. Wildfires can change the landscape and neighborhoods dramatically, so be observant for ash pits, unstable ground, downed power lines, contaminated water supplies, and collapsing structures to name a few. Be aware that these are just general tips to survive a wildfire scenario and in reality all survival situations will be unique. The most important piece of advice: stay calm. Panic makes everything worse, exacerbating your fear and ultimately replacing intelligent actions with reactive ones. S.T.O.P – Sit, Think, Observe, Plan! Anything I missed? 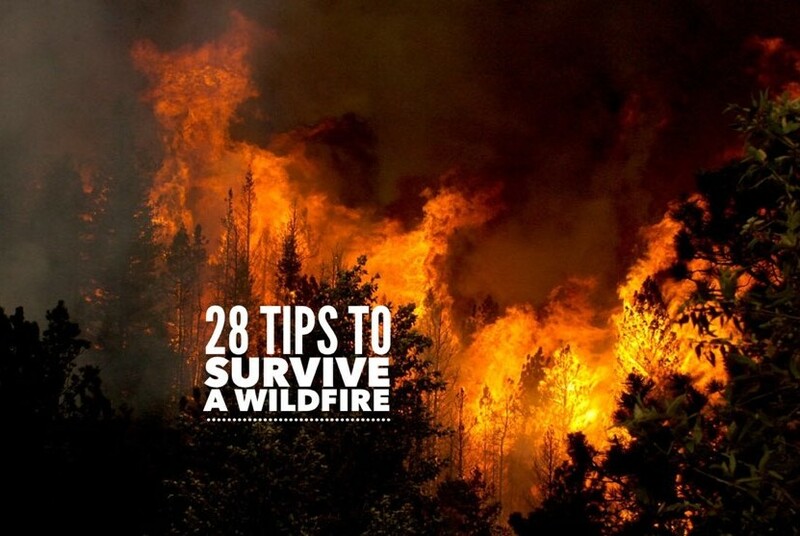 Do you have any tips to survive a wildfire?